Internship at ECOWAS Center for Renewable Energy and Energy Efficiency (ECREEE) is by volunteering and unpaid for a specific period of three to six months. Notwithstanding, the work pressure on the intern is high and the deadlines very tricky. This implies that strong self-motivation, determination and drive are important prerequisite for anyone considering taking up an internship opportunity at ECREEE since there is no immediate monetary gains at least in the short term. ECREEE’s secretariat is domiciled in the only island member country (Cabo Verde) of the ECOWAS region. Cabo Verde is about 1,815 nautical miles away from my home country, Nigeria. It was a difficult decision to leave my family and friends to take up an internship post in a different country. In addition to the cost implications are the emotional impact not only on me, but also on my family, friends and love ones whom I left to be in Praia. The experience has been quite a lonely one. I offered to undergo internship for six months duration. However, in the first two months of the internship, I worked alone from the general office provided for interns, since there were no other interns in the organization at the time. I stand to be corrected that I was the only person with an odd work status in the organization at the time. Those are my opinions as I realized that I was the only person who was not part of the organizational work force but perform the institutions roles. Outside the workplace, I was also faced with the challenge of language barrier which makes communication quite complicated. I speak English as a first language and neither understood the official Portuguese nor the widely spoken Creole languages in Praia. Therefore, finding my way around the beautiful city and purchasing commodities from the natives is been difficult. Being the pioneer intern of the ECOWAS Programme on Gender Mainstreaming in Energy Access (ECOW-GEN), I find my work schedule to be challenging due to the flexibility of the job roles. ECOW-GEN complements the effort of ECOWAS to achieving the expectations of the Sustainable Energy for All (SE4ALL) initiative as well as the fulfillment of the ECOWAS Energy Policies, (ECOWAS Renewable Energy policy (EREP) and ECOWAS Energy Efficiency policy (EEEP)), which support the inclusiveness of women and men in proffering solution to the energy crises which the region is currently facing. This has availed me the opportunity to participate in broad, diverse and interesting job contents than I had anticipated. My duties are under the direct supervision of the ECOW-GEN coordinator, Ms Monica Maduekwe, who has a smart and intelligent personality couple with an amazing passion for the job. Her positive attitude to work inspires me to work with extra effort to making sure that tasks assigned to me are accomplished within deadlines in order not to delay her fast working pace. My supervisor is like the encyclopedia for my tasks, she always avails me with answers to my questions. It is no surprise that she effectively functions as the only staff in ECOW-GEN. In addition to her poised work etiquettes and amiable career position, she is humble and down to earth. This was brought to bear when she took the initiative to pick me up by herself at the Nelson Mandela international airport in Praia on the 2nd of May 2016 on my first arrival in the country. My educational training is mainly in engineering, hence was drawn to ECOW-GEN through the Women Technical Exchange Program. My desire is to use my acquired skills which were gained through educational and professional trainings to make cogent contributions to the continuous success of the program as well as gain additional practical work experience. My highest educational qualification is a Master of Science in Engineering and specialized in Sustainable Energy Engineering. My first degree is Bachelors in Electrical and Electronic Engineering. From both major trainings, I have acquired expertise that is beneficial for the work scope. My passion for ECOW-GEN is originally driven by the limiting extremes confronted by the African girl child. Hence my desire to engage in initiatives that can positively make impact in the lives of women, children, the extremely poor as well as the low income population who are the most vulnerable in any possible way no matter how little. Besides, I have enjoyed quantifiable benevolence in the form of scholarships and sponsorships in the course of my education. To this regards, I am conscious that I owe a lot in return to mankind, hence, my determination to oblige. Thus, I find the ECOW-GEN of ECREEE to be a good starting point since my goals aligns with the ongoing initiatives. Sourcing information for the formulation of the ECOW-GEN Energy-Gender Data-bank for the fifteen ECOWAS member countries. This is for the purpose of giving support to the establishment of the gender policy monitoring and reporting framework of the ECOWAS policy for gender mainstreaming in energy access. The procedures involves searching the “situation analysis of Energy and Gender issues in ECOWAS Member States”, “ECOWAS Policy for Gender Mainstreaming in Energy Access”, “the programme document of the ECOWAS Programme on Gender Mainstreaming in Energy Access” and other ECREEE policy documents as well as international trustworthy organization’s data-bank. The individual member countries are also contacted through emails to provide unavailable data as well as verify sourced data. Upload of the Energy-Gender Databank unto the ECOW-GEN website using word press platform. Assisting in the preparation, procession and dispatch of contract and award letters in the ECOWAS Research Grant Program of the Initiative on Youth Leadership Development in Energy. Also processing of documents for the commissioning of the ANOMENA Improved LPG Stoves project under the ECOWAS Women’s Business Fund initiative. Responsibility of sourcing and publishing announcements of opportunities that contribute to the objectives of the ECOW-GEN network on the official website of ECOW-GEN.
Review and Harmonization of the National Energy Efficiency Actions Plans (NEEAPs), National Renewable Energy Action Plans (NREAPs) and the respective Sustainable Energy for All (SE4ALL) Action Agendas for English Speaking ECOWAS Member Countries. Establishment and maintenance of a comprehensive directory of Renewable Energy Entrepreneurs in the ECOWAS member states. This forms the basis of tailored interventions which targets the ECOWAS Regional Entrepreneurs, particularly through the ECOWAS Renewable Energy Entrepreneurship Support Facility. Tasks are supervised by the coordinator for ECOWAS Renewable Energy Entrepreneurship support Facility. Preparation of keynotes for the ECOWAS Small-Scale Hydropower and the ECOWAS Solar Thermal Energy Training and demonstration (SOLtrain West Africa) Programs. The duties are reported to the Sustainable Energy Expert to ECREEE in charge of the Programs. On the whole, I find ECREEE to be a worthwhile organization for any qualified candidate to undergo internship as there are vast opportunities for gaining cogent work experience through on-the-job training, high profile international workshops, site visits, technical meetings as well as inter-institutional forums. 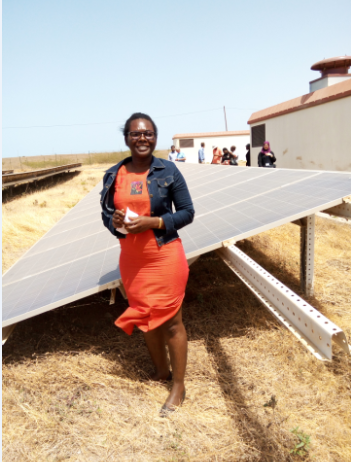 ABOUT THE AUTHOR: Ms Marvelous Bam holds a Master of Science in Engineering degree, MSc (Eng) and specialized in Sustainable Energy Engineering from the University of Cape Town, South Africa under the sponsorship of the African union commission. She has Bachelor degree in Electrical and Electronic Engineering of a cumulative grade point average of 4.37 on a 5 point scale. She is an author of several scientific publications and has received several scholarships and awards from non-governmental, national and international organizations. Scholarships and award received include; National Research Foundation (NRF) Innovation Masters Scholarship, South Africa (2015), Dutkiewicz Family Scholarship for Energy Research, South Africa (2015), FISB Scholarship Faculty of Engineering, University of Cape Town, South Africa (2014-2015), Mwalimu Nyerere African Union Commission Postgraduate Scholarship for women in Science, Technology, Engineering and Mathematics – STEM (2014-2015), Best graduating student, 2011 graduating class of the Department of Electrical and Electronic Engineering, CRUTECH, Calabar, Nigeria (2012), Federal Government of Nigeria Undergraduate Scholarship (2010), Cross River State Government Undergraduate Scholarship (2009), Senator Victor Ndoma-Egba Scholarship (2008) and Tabitha David Care Foundation Scholarship (2007).